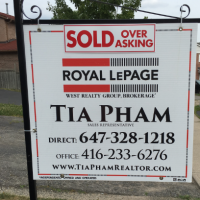 As spring quickly approaches, Toronto's real estate market is gearing up for a busy season and is expected to outperform itself. According to a Bloomberg report, Toronto's market is even hotter than New York's and shows no signs of slowing down any time soon. The evidence is in the bidding wars. Gone are the days detached homes would sell for $30,000 over asking. We are seeing homes selling for as much as half a million dollars over asking! The inventory simply cannot keep up with the increasing demand. Many frustrated buyers have begun to flood the condo market, especially larger units with 2 bedrooms or more. In the past year, bidding wars for condo units have become increasingly common. For example, a 2+1 bedroom unit in Barclay Terrace was listed for $569,000. A week later it sold for over $130,000+ over asking. Last year Vancouver implemented a foreign buyer tax and as a result it has significantly cooled down their market. Ontario had no intentions on following suit but a year later, is now reconsidering. The Toronto Real Estate Board strongly urges against the imposition of another tax on buyers which would be in addition to existing land transfer taxes. Purchasers in Toronto have to pay an additional municipal fee, as opposed to just provincial. What do you think could help to cool Toronto's market? Leave your comments below.